Everyday issues and challenges can make our lives seem complicated—and sometimes overwhelming. 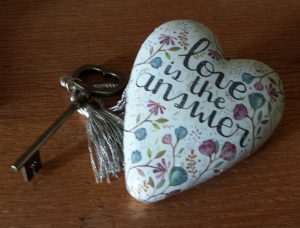 Life becomes much simpler, though, when we remember there’s only one answer to every situation: love. Available as a 20-minute Sunday morning talk or a 30- to 60-minute keynote. How have we been trained to see life through the lens of fear rather than love? What do children know that adults don’t? What are three deeply ingrained fears that we don’t even notice? How do those fears rob us of joy in our relationships and life work? How can we bring kindness and compassion into every situation? Within each of us is the still, small voice of Spirit. And within nature, the seasons provide a model of change. When we combine those two—a desire to listen to the Divine and a context for our own growth—we are comforted, rejuvenated and reminded of who we are. Winter gives us time for dormancy, which we can use for reflection and contemplation. Spring is a season of renewed energy and possibilities. Summer brings rapid growth and sometimes unexpected storms. And fall celebrates abundance, along with a sense of letting go. Through journaling, visualization, small group discussion, and gentle movement and music, we’ll explore the gifts that each season holds for you as we nourish and affirm your unique growth journey. This workshop is ideal for a church retreat or as part of a chaplain training. It can be presented in a two-hour, half-day, or full-day format. Have you ever felt like fear holds you back or keeps you stuck in life? Do you find yourself worried over relationships or situations that you feel powerless to change? Those fears can wear us out and make it hard to live with contentment and joy. But with a simple prayer, you can ask for healing and see the struggles in life fade away. Based on the best-selling book The Only Little Prayer You Need (featuring a foreword by the Dalai Lama) this presentation addresses the roots of fear-based thinking, with interactive exercises that will send you home with invaluable tools for a happier life. Available in a two-hour, half-day, or full-day format. Identify the fear-based thinking that keeps you stuck. Become aware of thoughts rooted in love and those rooted in fear. Let go of the “rattles in your dashboard,” the deep-seated thoughts that get in your way. Address fear-based thoughts about everything from finances to relationships, health concerns to family conflicts. Achieve a new level of self-love and acceptance. Understand and practice forgiveness in a new light. Recognize how your inner shifts will result in changes around you. Live fearlessly to create a better life for yourself, your loved ones and the world. Please contact kris@debraengle.com for a quote. 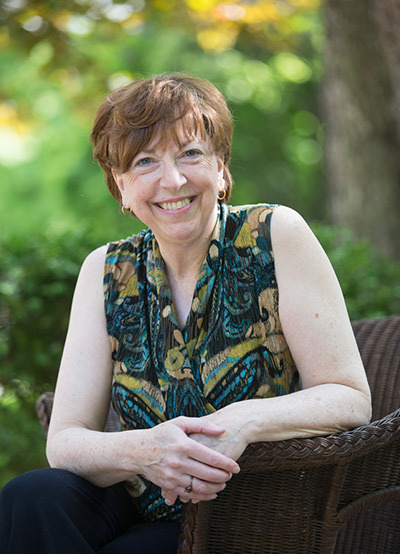 DEB IS AN EFFECTIVE SPEAKER with a calm demeanor, and she pulls you in with her clear thoughts, engaging stories and the sparkle in her eyes. She is a great communicator and creates a peaceful, joy filled energy when presenting—so much so that after our workshop people stayed for a while, talking and getting to know one another. Deb has taught A Course in Miracles and you can tell she is one of those great teachers who is extremely enthusiastic about what she teaches. She knows her stuff and practices what she preaches. I would highly recommend Deb as a speaker and/or workshop presenter. NEED A DOWNLOADABLE BROCHURE about Deb? Click on the image below. 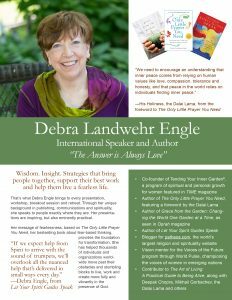 It is my pleasure to recommend Debra Engle as a guest speaker and workshop facilitator. She is an engaging, interesting speaker. I am familiar with A Course in Miracles and didn’t believe I could learn anything new. I was (happily) wrong. Her book is very relevant and gave me a new perspective. Her little prayer is powerful. She is very personable speaker, and her workshop was relevant and informative. I recommend her highly. Deb Engle presented a workshop to a group of woman from St. John’s Lutheran Church in Des Moines, Iowa. The group is known as WIRED—Woman Interested in Reflection, Education and Discovery. Deb was an excellent fit. Several members have mentioned that participating in Deb’s workshop helped them to deal with—and gain some resolution—to an issue that was worrying them. Her easy-going, educational and reflective process made the experience relevant to each person. She is a kind, caring and engaging speaker and facilitator. I had the pleasure of hosting a full-day workshop with Deb. From the beginning, Deb created an intimate atmosphere and engaged with each person in the class. As we discussed the basis of fear and its impact on our lives, Deb made sure each participant could relate her teachings to their own unique situation and allowed for vulnerability, tears and sometimes even skepticism without judgment or any type of critique. The room became a safety zone of trust and comfort. I have hosted many events with my business, and I can honestly say that Deb’s workshop was one of my favorites. Her authenticity, genuine caring and loving nature allowed for deep honesty from the participants, and all left feeling they had an actionable tool they could use in their lives. 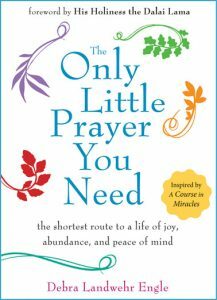 Deb Engle recently presented The Only Little Prayer You Need to our group. She is an excellent, professional speaker, and shares from her heart and her wisdom. Our group was thoroughly entertained and greatly inspired by what she shared with us. 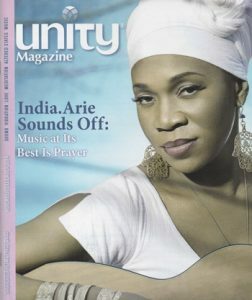 I feel she would be an asset to any program at a Unity church anywhere. She is very skilled at handling questions from the audience, and her people skills are fabulous. Everyone felt welcomed and nurtured by her presence. Wonderful presentation last night. Of course, I would have expected nothing less. You held everyone engaged and entertained. It was pretty obvious that this wasn’t the first time that you spoke to a large group. Just a terrific evening. Thank you! Debra Engle is one of the all-time favorite guests on my show. She is wise, caring, deeply thoughtful, provocative and full of fresh, inspiring insights. 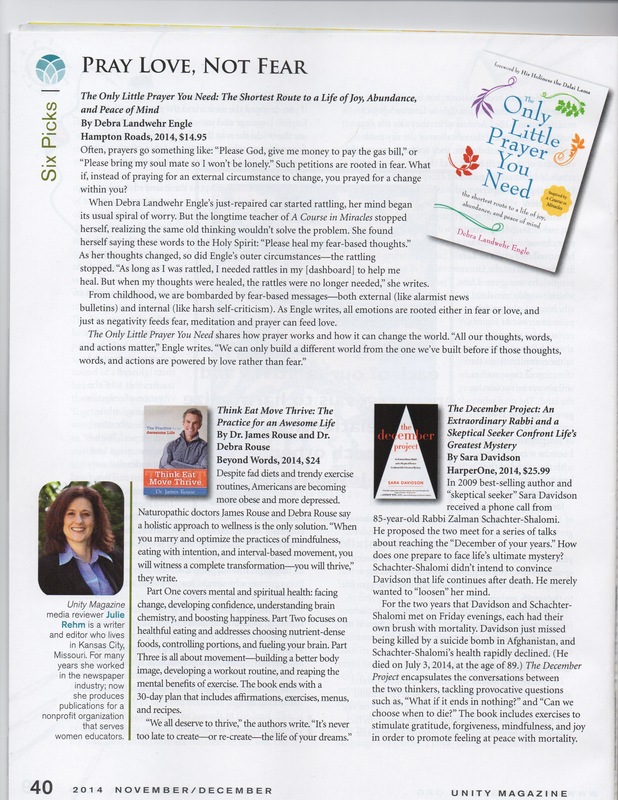 Choose The Only Little Prayer You Need or Let Your Spirit Guides Speak for a church book study. Books at a 50% discount direct from the publisher. Discussion questions that are ready to use. A video intro and welcome from the author. Or, contact Deb Engle to speak in person or via Skype as a kick-off or conclusion to your book study. 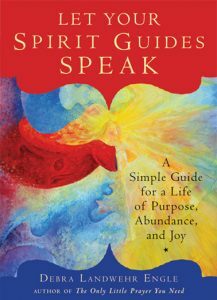 To purchase copies of Debra Engle’s books for your church or spiritual center bookstore, contact customerservice@rwwbooks.com. ©2016 Debra Landwehr Engle. All Rights Reserved.